We are a huge fan of Usborne books in this house - since we first discovered their baby range of 'That's Not My...' books back when Bert was a baby, Usborne have become our go-to publishers when it comes to purchasing new books for Bert to enjoy. Back in October Bert was bought a non-fiction book from Usborne's '1000 Pictures' range called '1000 Things to Eat' as a present from my lovely friend Emma (thanks Em!) 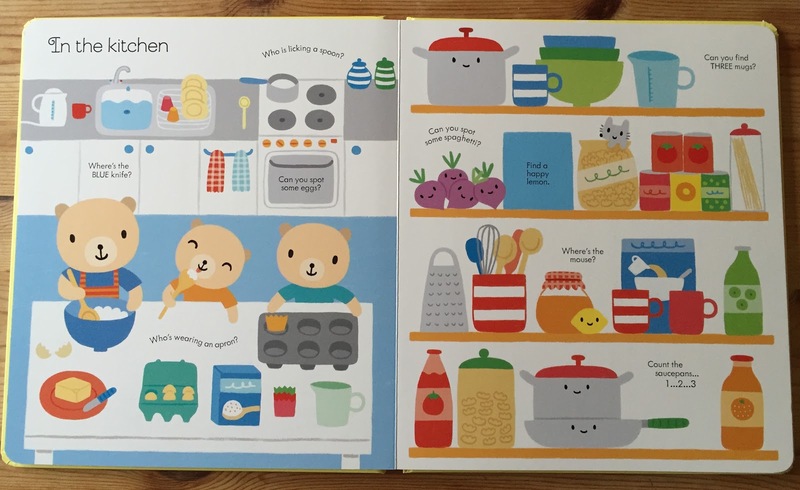 - the book is a stunning large hardback picture book with beautiful painted illustrations of 1000 different food items broken down into categories such as fruit and veg, sweets, cakes, Italian food, meats, fish etc. Bert absolutely adored this book from the moment he got it, and he still picks it up on a daily basis seven months on. We found that reading this book with him regularly has not only massively helped to develop his food-related vocabulary, but he now recognises so many food items by sight from the normal everyday items to the very obscure...and at just 2.5 years old we think that's pretty impressive! Then a few weeks ago I got chatting to my local Independent Usborne Organiser Maxine Bone, who is based in my hometown of Bedford, and she offered to send us a selection of new Usborne books to add to Bert's collection. I naturally jumped at the chance as we are already such a fan of these wonderful books - I was excited to add to Bert's collection. 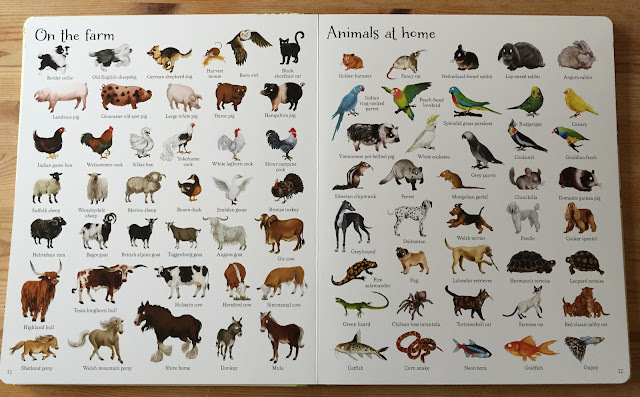 I hadn't realised that there was a whole range of '1000 Pictures' books, so when I saw that they also have '1000 Things That Go' and '1000 Animals' in the range, I knew Bert had to have them. He is animal mad and really loves his transport - so they couldn't have been better topics to pique his interest. As well as the two '1000 Pictures' books (which are each priced at £9.99) I also ordered First Thousand Words in English priced at £6.99 and Very First Things to Spot at Home priced at £7.99. Maxine took care of the order for me, and delivered my books for free within a week - what a fabulous service! Any Bedford locals looking to treat their little ones to some new books...Maxine is your lady! 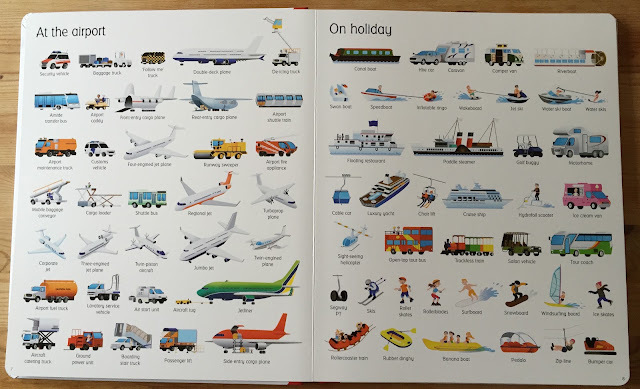 Bert is especially loving this page of '1000 Things That Go' from Usborne at the moment, as his Nanny & Grandad are on holiday, and they went on a Ferry Boat! 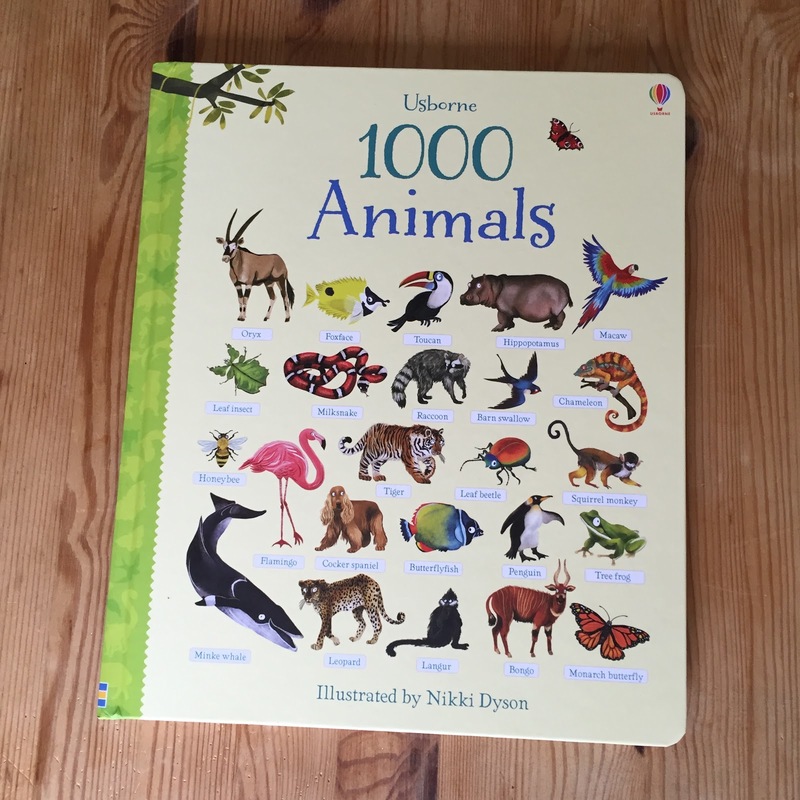 '1000 Animals' from Usborne books...we are learning some new VERY obscure animals thanks to this book! There's animals in here even Mummy & Daddy have never heard of! 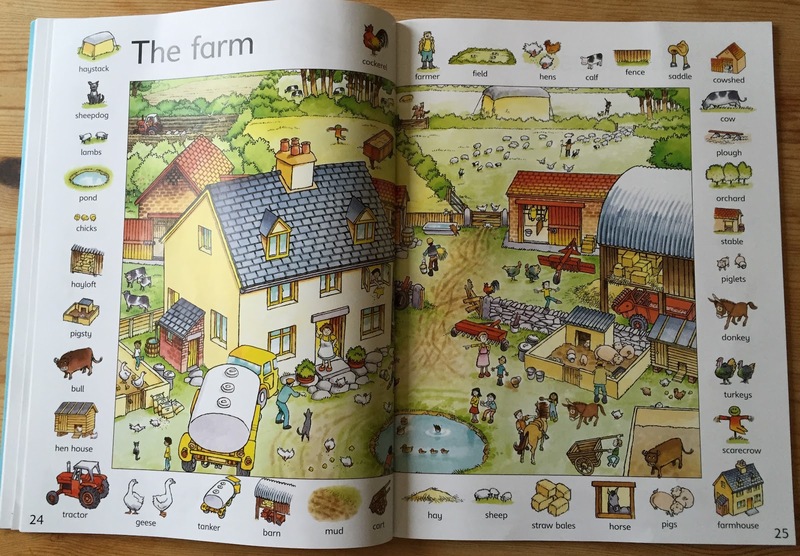 Animals on the farm and animals at home...we knew these! 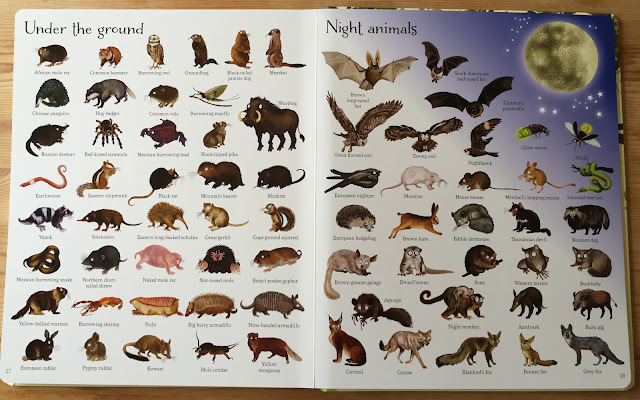 Bert loves learning about animals which come out at night - he has a thing about bats, hedgehogs and foxes! The thing I love most about Usborne books (aside from their quality) is the brilliantly diverse range of non-fiction books they make for children, especially at a toddler/pre school level. 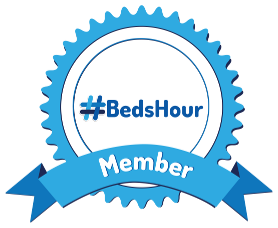 We have story time with Bert every night without fail before bed and we have always enjoyed reading him a mixture of fiction and non-fiction books to ensure he learns and develops factual knowledge and vocabulary as well as expanding his imaginative development. Without books like this from Usborne we'd be limited to the 'colour' 'first word' and farm animal style board books so often aimed at babies and toddlers - they wouldn't stretch Bert enough or keep his interest for longer than a few minutes. 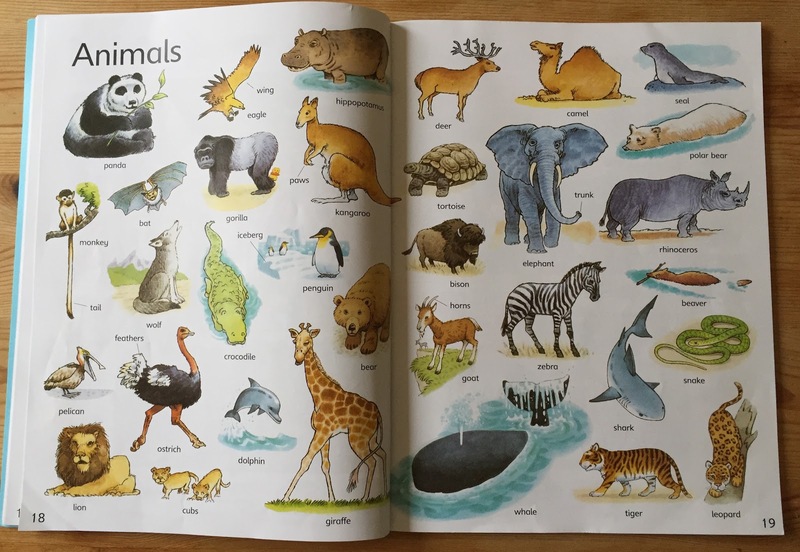 With the '1000 Pictures' range Bert is able to sit for really long periods of time studying each page, and learning to name each animal - with the help of Mummy & Daddy's reading skills. 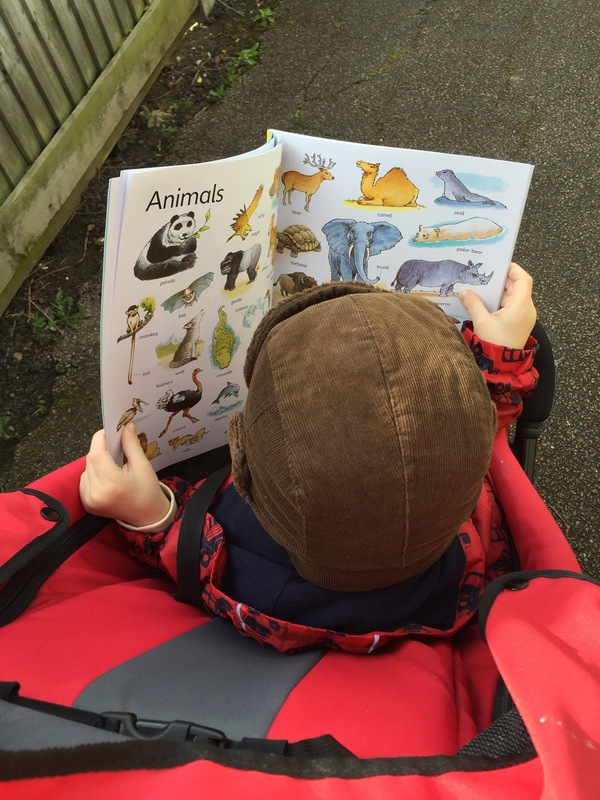 He has genuinely learnt some pages of the '1000 Pictures' books off-by-heart already, and he can apply that knowledge when he sees the same animal/food item/mode of transport in a different book or on TV - so it is most definitely teaching him a huge amount. 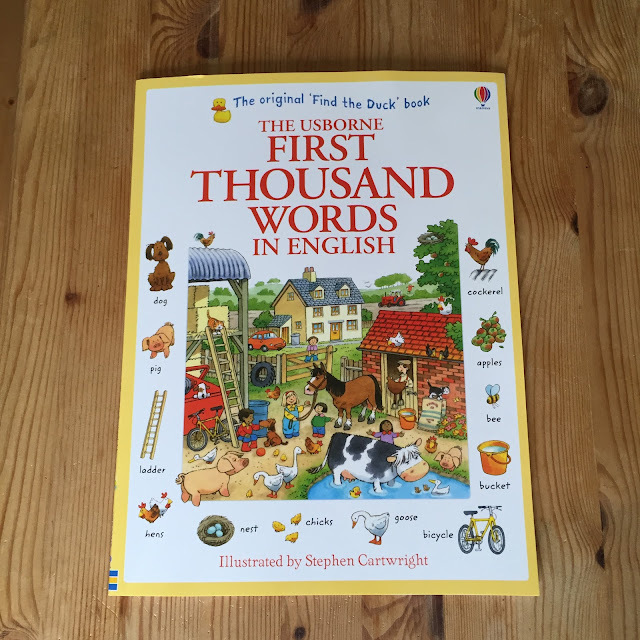 First Thousand Words in English by Usborne books - I remember these 'spot the duck' books from my own childhood, so it's a real pleasure to be able to share them with Bert and see his enjoyment of them. 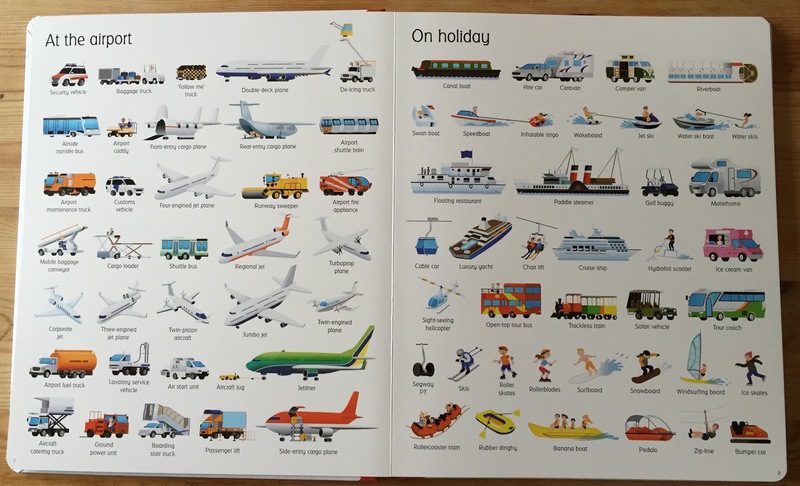 Inside 'First Thousand Words in English' by Usborne books - so much to look at! Bert's favourite page in 'First Thousand Words in English' by Usborne books - animals...naturally! 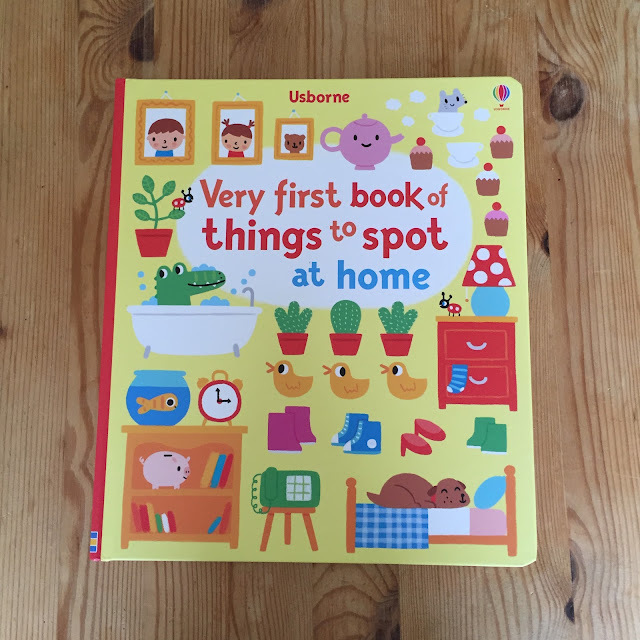 'Very First Book of Things to Spot at Home' by Usborne. This hardback book is so beautiful and the illustrations are just adorable! Needless to say Bert is totally thrilled with his new books, and he's blown our mind especially when it comes to being able to answer all of the questions in the 'Very First Things to Spot at Home' book: he races through it at speed and after only a week and a half of owning the book he is able to answer all of the questions correctly! He gets so much enjoyment from searching each page for the correct answers. I'd definitely recommend this style of book if you want to encourage a fun way for your child to learn/develop their language and comprehension skills. In fact, Bert has loved his new books so much that he's even requested to take them out with him in the buggy! Ha! 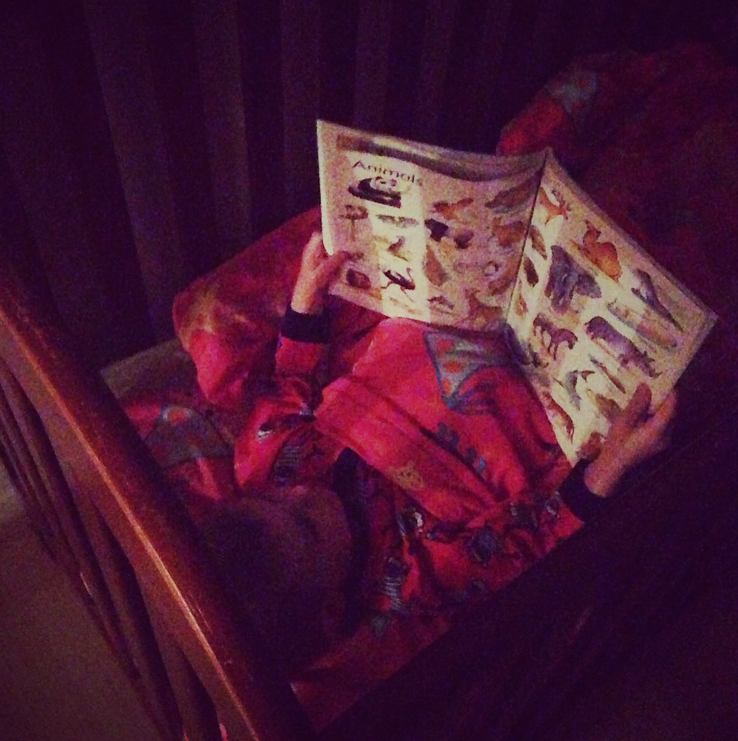 Bless our little book-worm! 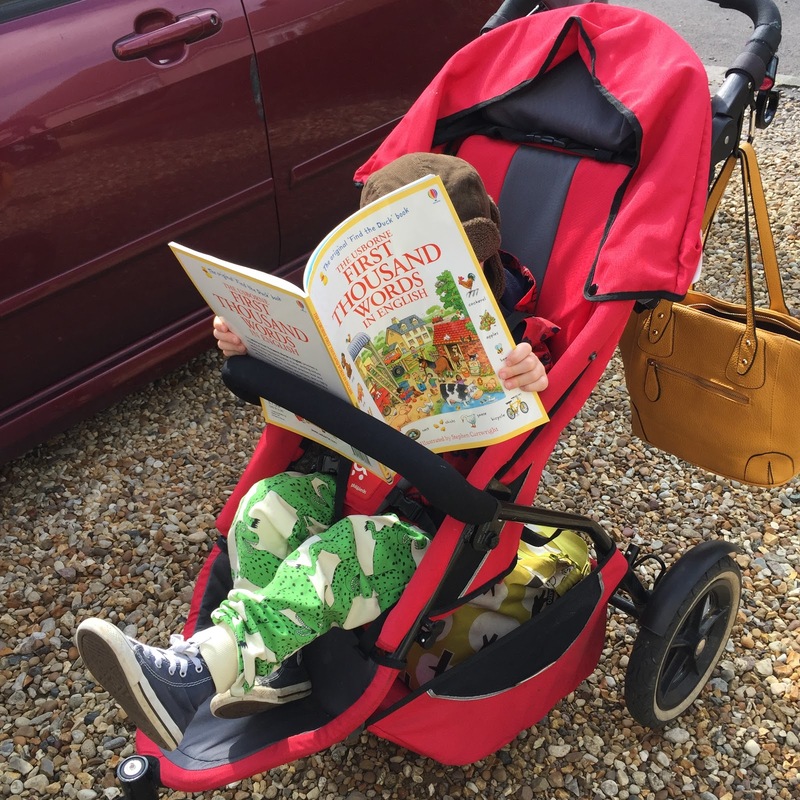 If you are Bedford-based and looking for the right Usborne book for your child, there are lots of ways Maxine can help you. 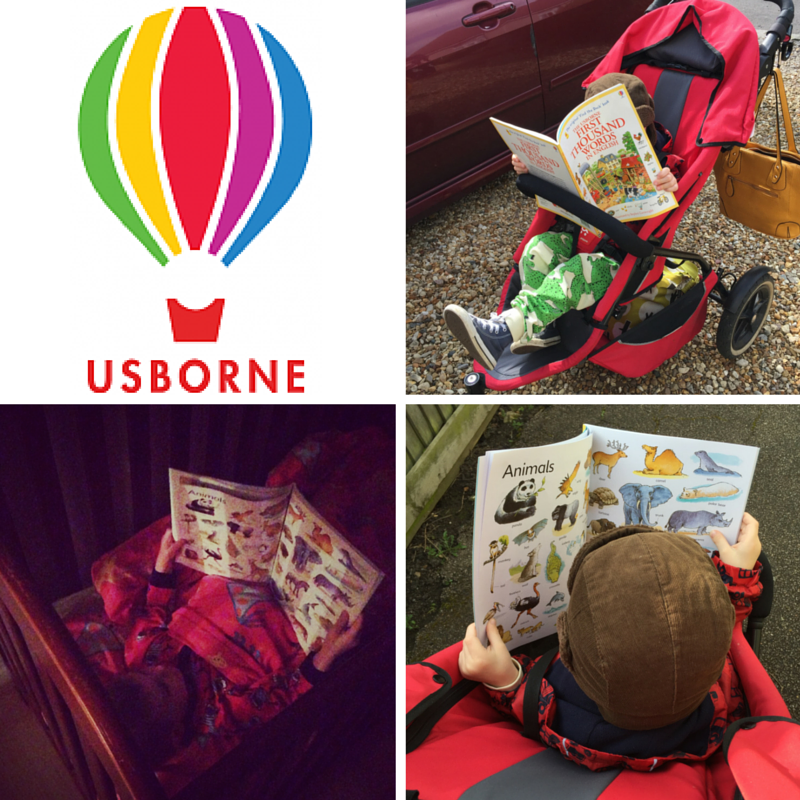 You can buy online or, if you are interested in having an Usborne party, school event, or a Facebook Online Party you can enjoy additional benefits such as free delivery, exclusive special offers, discounts and even free books! Maxine also holds a story time sessions at Gallone's Ice Cream Parlour, in the old arcade, Bedford every Tuesday morning 9.30am-10.30am which is suitable for ages 5 yrs and under. It's completely free and she also does some rhymes and songs too! 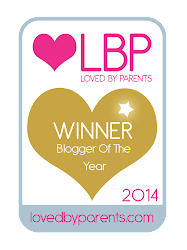 It's in the upstairs party room complete with twinkly lights - what's not to love? You can shop with Usborne directly online here. 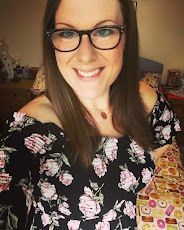 Disclosure: I was sent the four Usborne books mentioned in this post for free in exchange for my honest review of the books and the service I received from Maxine Bone. All words, pictures and opinions are my own. 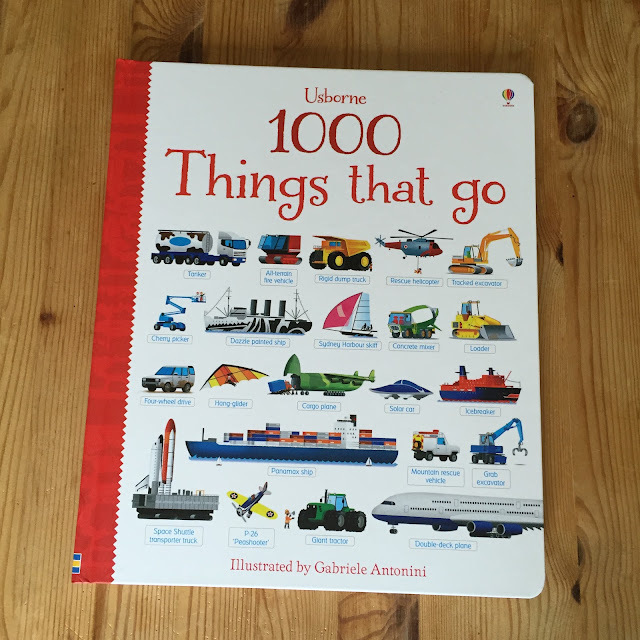 We had some of the "1000 Words..." books when we were younger - I think there used to be some link between the school PTA and the local Usborne Rep when my Mum was chairlady for the PTA. When Daddy and I are both at home for bathtime/bedtime, story time becomes like a family event, the world stops for bath, book, milk and cuddles lol. Favourite stories at the moment are How to Bath Your Little Dinosaur (we got that one from Rogan's with Jaxon's pocket money from his Great Grandparents) and The Teeny Weeny Tadpole. He also had one which is the Five Little Ducks rhyme and it has a row of ducks that you slide backwards and forwards. Now he's in his toddler bed I regularly go up at my bedtime and have to quietly restack all the books onto the bookcase!